ASRock Launches The World's 1st AMD Mini STX Platform at CES 2019- DeskMini A300. The leading global motherboard and graphics card manufacturer, ASRock, pleasure to announce the world's first AMD based Mini STX Platform - DeskMini A300 at CES 2019. It adopts with AMD A300 chipset, not only supports AMD AM4 65W APU, but also provides up to 32GB DDR4-2933MHz high-speed memory, which leads to outstanding computing power and 3D performance. DeskMini A300 offers up to 4 storage interfaces, supports three display outputs simultaneously, M.2 Wi-Fi module and various accessories within 1.9 Liter compact size. 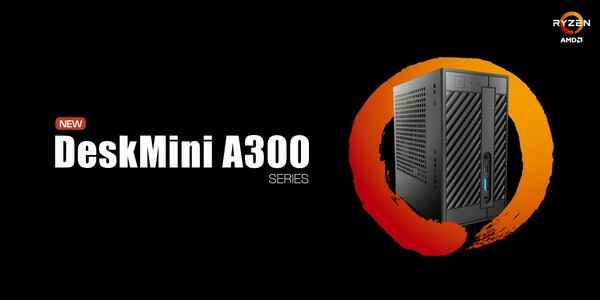 DeskMini A300 is an ideal choice to build a home entertainment PC and mini data center.